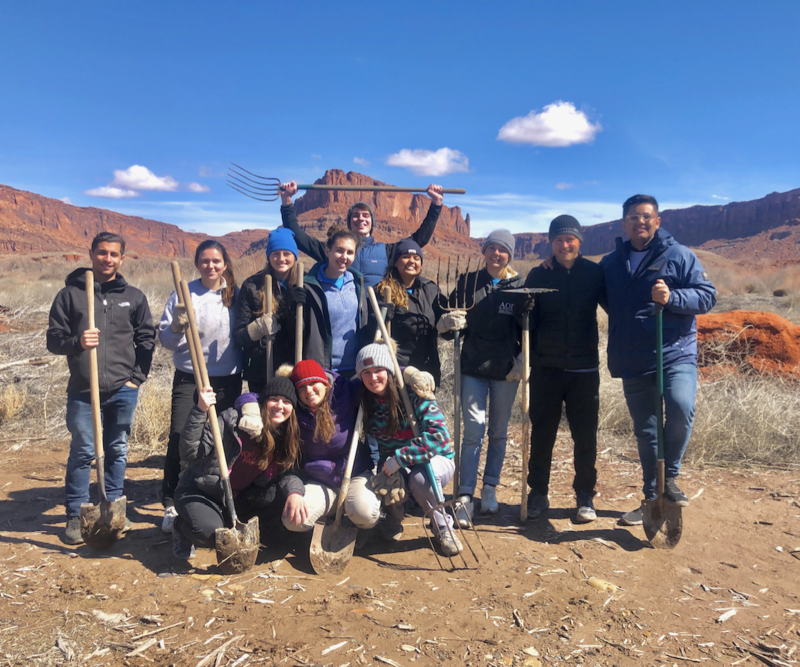 Armed with shovels and hoes, students removed invasive species at an ecological site in Moab, Utah. While some students stuck to the sun and sand for spring break, others spent their time giving back to various communities around the U.S. From working with women in Chicago to removing invasive species in Utah, student groups participated in “Alternative Spring Breaks” as part of Rollins’ Immersion programs, which are community service-oriented programs working with organizations or communities in need. Chicago, Ill.: Students focused on social issues that disproportionately affect women and children, such as poverty and homelessness. They worked with community partners who affect women’s lives directly or indirectly through children: for example, New Moms, Cradles to Crayons, and Dress for Success. Emily Block, associate director of Jewish life; Silvana Montanola Ayala (‘20); and Jordan Halloran (‘19) facilitated the trip to the Windy City. “The awesome part about a lot of our community partners is that they work together to provide women the tools they need to get jobs, manage a budget, and care for a new child,” said Halloran. 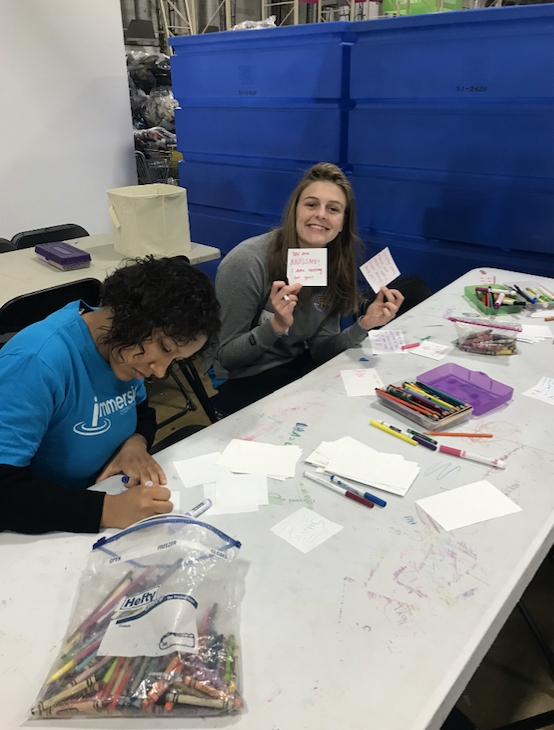 By writing letters of encouragement to women in Chicago, the group advanced their goal of empowering the city’s most vulnerable women. Washington, D.C.: Students visited Washington, D.C. to explore the impact area of youth education. Along with exploring the national monuments and Smithsonian museums, students partnered with the Boys and Girls Club of America, a group dedicated to helping young people reach their full potential. The students tutored and played games with young kids, painted inspirational messages on the stalls of the boys and girls bathrooms, and helped decorate the pre-teen center. Facilitators of the immersion included Karina Andujar, admission counselor, Kyaira Banks (‘19), and Sydney Rock (‘20). 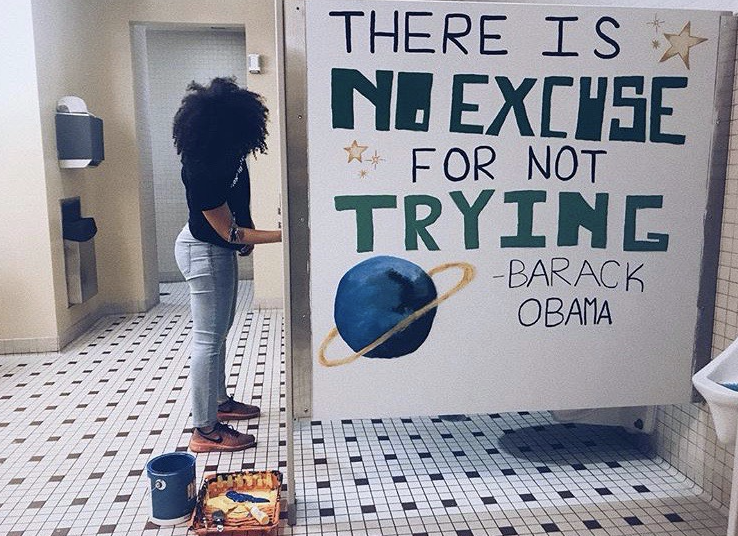 Students painted inspirational messages on Boy and Girls’ Club bathroom stalls in Washington, D.C.
Moab, Utah: Students traveled to Utah to learn about environmental conservation. They removed invasive species along the Colorado River and revegetated the area with native species. Facilitators were Matthew Díaz, administrative assistant at the Office of International Student and Scholar Services, and Crummer student Cami Craig (‘20). Panama City, Fla.: In light of Hurricane Michael, students went to the panhandle to aid in disaster relief. First, they organized items for the Bay County Habitat for Humanity ReStore. Jackson Nguyen (‘19 HH), one of the immersion’s facilitators, said one of the Habitat for Humanity staff’s experiences with Hurricane Michael brought her to tears. The students got to hear other staff members’ stories in a Q&A after volunteering. The students also cleared hurricane debris at the Bay County Conservancy. Other facilitators included Donna Dormeus (‘21 HH), graduate student Brianda Gonzalez Perez, and CLCE Community & Office Coordinator Sofia Macias. Atlanta, Ga.: In Atlanta, students studied homelessness and food insecurity. They worked and spent two nights in a homeless shelter meeting individuals who stayed there and hearing their stories. They also worked at a furniture bank, a food bank, and an organization that offers affordable housing for community members. Facilitators included Tami Diebel, executive assistant of Career and Life Planning; Ahmed Rashid (‘19 HH); and Izadora Rabelo (‘19).